La grande variante de la défense est-Indienne. The King’s Indian Defence is one of Black’s most dynamic and aggressive responses to 1.d4. A favourite weapon of both Fischer and Kasparov, it remains a popular choice at all levels of play. 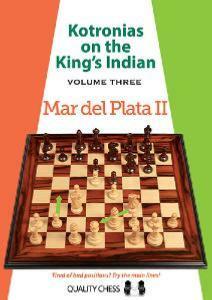 In this, the third volume of the Kotronias on the King’s Indian series, grandmaster Vassilios Kotronias presents the second part of his world-class repertoire against the famous Mar del Plata variation, starting from the position after 1.d4 Nf6 2.c4 g6 3.Nc3 Bg7 4.e4 d6 5.Nf3 0–0 6.Be2 e5 7.0–0 Nc6 8.d5 Ne7, with the focus on 9.b4, 9.Nd2 and all other sensible alternatives to 9.Ne1. Once again, Kotronias provides a turbo-charged repertoire for Black, with a plethora of novelties and original analysis. As well as providing detailed analysis, the author also shares his considerable knowledge of typical middlegame themes, both positional and tactical. A special selection of test positions is provided, enabling the reader to sharpen his tactical skills and increase his middlegame understanding.